Snorkeling is swimming with a diving mask, a snorkel (A shaped tube) and usually fins. Snorkeling allows you to observe the underwater attractions with your face down on the surface of the water without having to coming up for air for extended periods. No certification is required for snorkeling and the activity is suitable for people of all age. The fins and mask will help greatly with your movements and floating, therefore only basic swimming skills are needed to participate in snorkeling. The best time for snorkeling is when the waves are minimal and the sun is out. For Bali, that usually mean any time between November and May. It is important to go snorkeling in a sunny day as the sunlight increases visibility and therefore promises the full snorkeling experience. It is recommended you apply sunblock all over your body before the snorkeling unless you plan to wear a wet suit or diveskin. Most dive boats primarily cater to scuba divers, very little care is given to the snorkelers, it is always safer to have on site instructors and dedicated care. 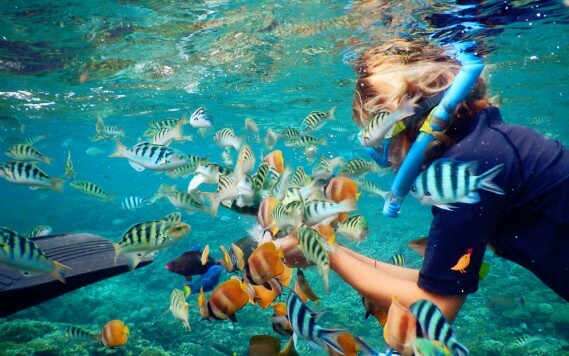 Snorkeling at the beach can be fun, but if you want to get to the best snorkeling sites, a boat is needed for access. A guide that is professionally trained in both assisting snorkelers and local coral environment will ensure a smooth and excellent snorkeling that is not only safe, but also satisfies your need for exploring the unique coral environment around Bali. At tour from bali, we provide snorkeling package that cater to your needs as well as the best designed package for a visitor. The package includes hotel pick ups, snorkeling equipment, boat ride, insurance and instructor. Contact us today to let us know about your snorkeling expectation.